The drive towards Newport, RI on Hwy. 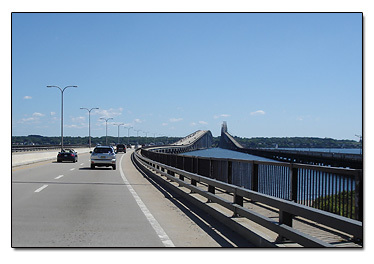 138 is very scenic, and you'll have to go over the Jamestown bridge to reach the Newport bridge. The old Jamestown Bridge is still standing alongside the new Jamestown Bridge. 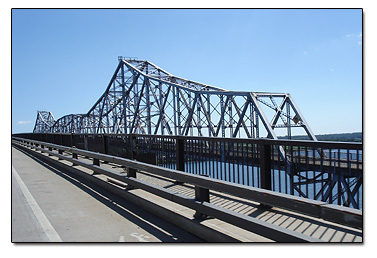 It's so interesting to look at the old two lane bridge, and imagine yourself back in time to the 1950's or 1960's. The last time we drove throught here they were taking the old bridge down. All the old streetlights are still there too. We have seen people fishing from this old bridge. This lower picture is a closer view of the old Jamestown Bridge. There is no toll for going over the new Jamestown bridge. 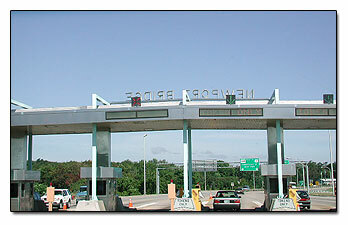 The Newport bridge is a toll bridge, and you have to stop and pay, or drop a token. The charge per car is $2.00, or you can buy 11 tokens for $10.00. At night the Newport Bridge is all lit up with lights and not one single bulb is burned out. How nice it was to be able to park our car, and stroll down a small street to the harbor. You could just feel in the air the history of the area. A lot of the stone walls that hold up the docks, were really old. Layer upon layer of different kinds of stones. We also found it interesting that most people have not put their boats in the water yet. I wonder when this happens. I'll bet when they do put their boats in the water, you won't even be able to see these piers and docks at all, maybe not even the harbor! 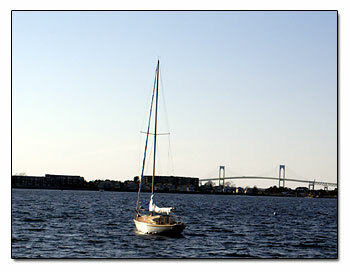 See the map to view where the Newport Shipyards are located. An antique shop owner, Rocco, in the Harbor Antique Center told us that April 20 a Cruise ship from Germany docked in Newport harbor. I wish we could have been there to take pictures! He said they have many cruise ships that will take you on a trip around the world. The Rose Island Lighthouse is a mile offshore and there is a bed and breakfast there now. 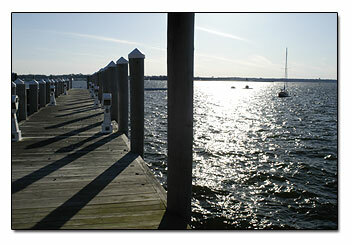 Hog Island Shoal - Built in 1901- Active - Located at entrance to Bristol Harbor. Bristol Ferry - Built 1855 - Inactive - Private Residence. 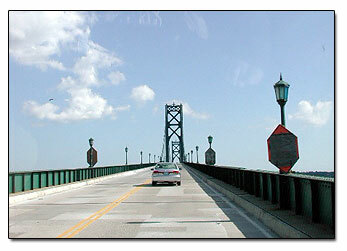 Located on Ferry Road, south end of Mount Hope Bridge. Prudence Island (Sandy Point) - Built 1823 - Active - Relocated from Goat Island in 1851. Accessible by ferry from Bristol. Nayatt Point - Built 1856 - Inactive - Private Residence. Located at end of Nayatt Road, Barrington.